GM Jermome Billones (left) checks out the details of a concluding game. The finalists mug for their victory photo. Only Nick Anner (right) had prior laurels. 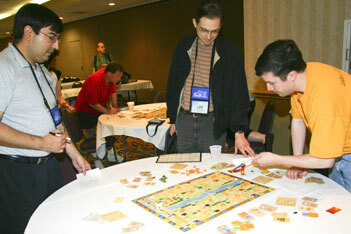 Four-player games were played with the same three provinces removed before the game (Abydos, Amarna, and Kharga). Due to the removal of the 4-power-card province from the game, the requirement for the Power Card bonus card was reduced from 7 to 6 in those games. The two heats saw 16 tables in play, an increase from last year but still not quite enough to expand the semi-final field. The intent was for the 16 winners to comprise the semi-final field, but one winner deferred, allowing one alternate to advance. The 16 semi-finalists each played a four-player match, with the four winners advancing. 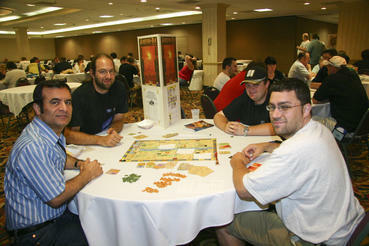 The lead table featured former champions Arthur Field and Nick Anner. After the Old Kingdom, both were tied with Robert Cranshaw at 12 VPs. Matt Calkins ended with the most cash and saw the other three all tie for second cash, and for the second time in three years Arthur was knocked out of the semis by another former champion. Two of the other semis went to tie-breakers, with Curt Collins advancing on Most Pyramids while Greg Crowe was forced to watch alternate Sam Atabaki edge him on the 5th and penultimate tiebreaker, Most Cash. In the Final, Curt Collins built a 15-13-9-3 lead with Memphis, Mendes and Buto. The New Kingdom was marked by high bidding; Sam Atabaki saw a bid of 15 for Memphis topped by Brian Kovel at 21, but then bought Abu for 15 and Thebes for 28. High sacrifices fueled the cash pool (14 in round 5 and 21 +3 in round 6). At the end, Sam had the most cash (edging Curt 54-50), and played three power cards to pull out a 36-34-30-29 win. Seat position seems irrelevant (5-2-2-2-2, 2-0-3-3; three year 8-4-8-9-6, 5-5-7-6). Most pyramids (11-10, three year 29-29) and most cash (6-15, 19-39) remained consistent from previous years, and a halftime lead is proving to be only slightly better than most cash (8-13, 27-31). Raphael Lehrer posted a tourney high 46 in the second heat, with a low of 20 in heat 1. Table averages in the heats ranged from 31.2 to 40 (similar to previous years) with the semis at 38.3/36.5/34.8/34.3 and a Final of 32.3. WOJTASZCZYK WINS AMUN RE: Kevin Wojtaszczyk emerged triumphant over a field of 30 players in our first on-line Amun Re Tournament. The 30 engaged in a round robin format of six five-player games to ensure that each player played everyone else once in the six-round preliminaries. Tom Dunning emerged from the Preliminaries with the top score of 47 followed by Kevin in second with 43 points. The top 12 scorers then engaged in a three-round semi-final, again playing each other once in three four-player games which proved to be very close - one game being decided by a total difference of just three points between first and last. This led to a five-player Final for the title. Mike Kaltman (6th in the preliminary round) took second followed by Alex Bove (5th), Eric Freeman (4th), and Tom Browne (3rd). Tom Dunning fell to sixth.